HomeArchiveTwo Lost Thorn Books Back in Print! Great news: After some negotiation, AFP has made a deal to bring back TWO Victor Thorn books that were in desperate need of a publisher. 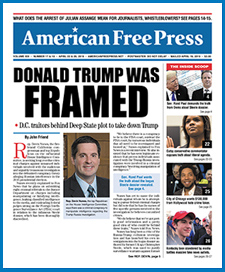 American Free Press is now the only authorized publisher and distributor—in print and electronic versions—of these two Thorn 9/11 blockbusters . . . These two dangerous books are back In Print! 9/11 Evil and 911: Made in Israel are, together, “the most dangerous 9/11 books out there,” according to late author Victor Thorn (1962-2016), acknowledged as one of the world’s preeminent 9/11 scholars. Special discount offer: Regularly priced at $15 each, you can get these books as a set for just $25. You save $5—that’s a 16% savings. Add just $5 S&H in the U.S. Add $25 S&H outside the U.S. Call 1-888-699-6397 toll free Mon.-Thu. 9-5 ET to charge or purchase online from the American Free Press bookstore, here. This is the book that many influential 9/11 organizations and individuals don’t want you to read or talk about. This is the book the ADL doesn’t want you to read or talk about—they describe it as “preposterous,” simply because the evidence compiled points a finger at Israel as a major player in the September 11, 2001 terrorist attack on America. But facts are facts; we do not control where they lead. We already know why 9/11 was done, and we already know how the WTC towers were destroyed (via controlled demolitions). But for some reason, most everyone wants to shy away from WHO ultimately did 9/11. In the author’s opinion, the nation of Israel played a central role in the 9/11 terrorist attack on our country, and Thorn presents overwhelming evidence in the pages of 9/11 Evil. Get this book here. Get both books here. But 9/11 was much more. It was an “outside” job also, ultimately made in Israel, as a mountain of evidence compiled in this landmark book clearly shows. This book sets the record straight by focusing on the actual puppet masters. Jewish control of World Trade Center security and Jewish ownership of the WTC complex is only one piece of the 9/11 puzzle that Thorn meticulously pieces together. Only one nation and group of people benefited most from the attacks on 9/11: Israel and its Zionist allies. As Israeli PM Benjamin Netanyahu boasted before an audience at Bar-Ilan University, “We are benefiting from one thing, and that is the attack on the Twin Towers and Pentagon.” Considering the fact that the rogue state of Israel has a prior criminal record of perpetrating just such a crime—the June 8, 1967 attack on the USS Liberty—the verdict in this case is clear: 9/11 was made in Israel. Victor Thorn was also the author of 9/11 on Trial: The World Trade Center Collapse, Phantom Flight 93 and Other Astounding 9/11 Mysteries Explored, 9/11 Exposed and countless more articles and booklets on the subject of 9/11 and the New World Order. 1 Comment on Two Lost Thorn Books Back in Print!